Thredz Spring Summer Lawn Collection 2015 has been revealed to the affectionate people who love to wear casual wear designer dresses in all 365 days of year. The collection is the combination of Trendy, Playful and Casual that is the philosophy of Thredz fashion label behind its latest spring summer lawn collection 2015 for ladies. Thredz Pakistan introduces nine unique spring summer designs 2015 for females. They categories their latest collection as seperates names like Crossing, Checkmate, Rose, Autumn, Prick, Dot, Brown, Snow Drop and Tulip. Each design in Thredz Spring Summer Collection 2015 is available in two different colors, and all standard sizes like small, medium, large and extra large. This is not a unstitched fabric spring summer lawn collection. These are ready to wear lawn dresses, prepared for the hot spring summer seasin which going on in Middle East, Pakistan and India. The price range of Thredz Spring Summer Lawn Collection 2015 is between PKR 2800 to PKR 5500 (Pakistani rupee price). You can choose your desire size, design and other alteration option also available but additional charges will be added. Thredz clothing brand reveals an eye-catching range of women wear lawn dresses, incorporated fine quality digital light and natural color prints, all over designs are trendy these days so Thredz included mostly all-over designs with elegant embroidery patterns. 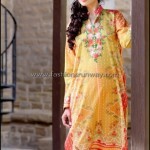 Rainbow is white self printed kurta on which multicolored floral pattern is used. Stunner has middle and side panel partition. A wave as name shows is ocean blue kurta with a square neck design and printed damann. A good-humored décolletage devise harmonizing with a wonderful flower design on the front and back side or kurta. Natural colors compare with a dark embroidery threads on the kurta necklines, borders and sleeves with the blend of flowery designs looks stunning. Thredz Digital Prints Kurta Collection 2015 for spring summer season included the must have lawn designs for ladies. Check below here Thredz Pakistan latest spring summer ready to wear lawn dresses 2015 for women, complete online catalog designs with prices.